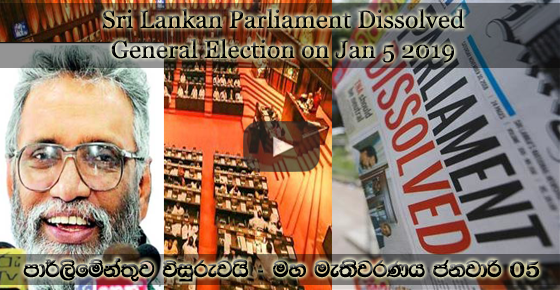 The notice in the Gazette regarding the dissolution of the parliament of Sri Lanka, signed by President Maithripala Sirisena, was published Friday (09-11-2018) midnight, according to news sources. The Gazette states that the general election to elect a new member to Parliament will take place on January 5, 2019 and that the new Parliament will be convened to meet on January 17, 2019. Meanwhile, the nomination period is set from 19 November 2018 to 26 November 2018 12 noon. Opinions of lawyers and several peoples available on this video. At same time, the Sri Lankan Electoral Commission, Mr. Mahinda Deshapriya, describes the current situation and the possibility of commencing general elections in Sri Lanka. Disclaimer: All logos, trademarks, video/audio, stream content and sites links names in this site are property of their respective owners. All videos/audios and stream content found on our site are hosted from a third party servers and they are freely available on internet. LankaWebNet.info DOES NOT host any videos/audios and stream content on our web pages so we are not responsible for those content.